Haryana Public Service Commission, Is Appointing Eligible People To The Group D Posts. So Interested People Can Apply For This Job Through Online Process Within The Given Time Period. 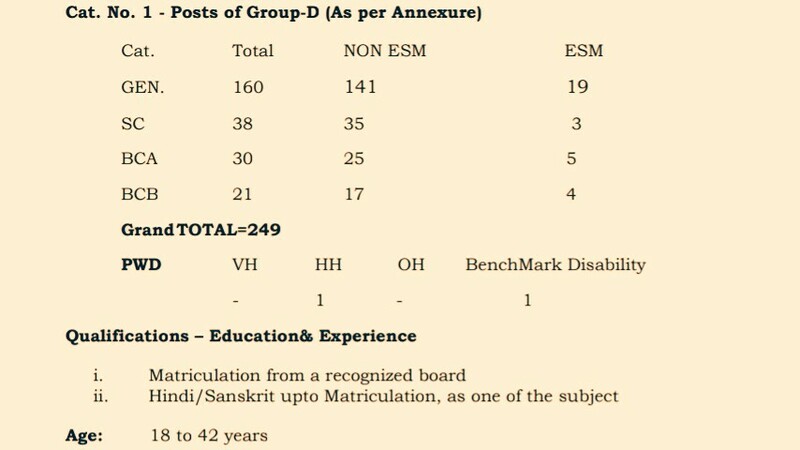 Group 'D' Posts →249 Vacancies, Kindly Do Go Through The Image's Below For Vacancies Distribution, Age Limit, Educational Qualifications. B. Eligible Criteria For Group 'D' Posts Job Vacancy In HPSC Recruitment 2019 Notification. Age Limit →Check Out The 1st Image Above. Educational Qualifications →i. Matriculation from a recognized board ii. Hindi/Sanskrit upto Matriculation, as one of the subject. Mode Of Examination/Selection Process →i) Written Exam: 90 marks ii) Socio-Economic criteria and experience: 10 marks. Online Application/Examination Fee→Check Out The 2nd Image. Now Apply For This Job Of Haryana PSC Recruitment 2019.